Flying with kids is no easy task, which is why many frequent flyers put their travel plans on hold once they have children. For one, kids require a lot of stuff. Also, it’s incredibly expensive to fly your entire family anywhere. But what if it didn’t have to be that way? Frontier Airlines announced it will fly children under 14 for free on select dates throughout 2019, per a report from The Points Guy. One child can fly free for each adult (anyone 15 or older) on the ticket. The catch, however, is that you have to be a Discount Den member, which costs $59.99 per year -- a small price to pay to be able to travel with your kids on the cheap, though. Additionally, the offer only applies to specific dates throughout the year. Luckily, many of the dates also happen to be Mondays, Tuesdays, Wednesdays, and select Saturdays, which are often the cheapest days for air travel. More dates are expected to be announced as Frontier extends its flight schedule. While this deal may sound too good to be true, it’s actually legit. Frontier’s kids fly free promotion will be available on all the aforementioned dates, provided there’s space on the flight you choose. 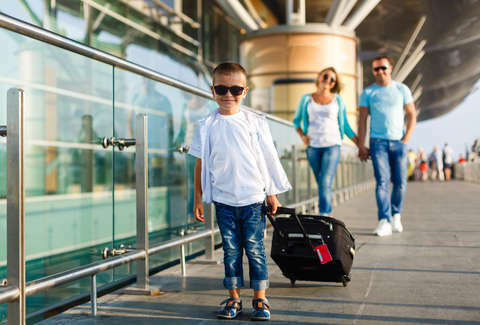 Although you won’t have to pay for your child’s ticket, add-ons like checked baggage, full-sized carry-on bags, stretch seats, and seat assignments will cost you. It is a low-cost carrier, after all, and luxury comes at a cost. Provided you’re less picky than say, a toddler, this is a great deal.